When it comes to dinner, many people’s favourite part is dessert. Who can blame them, right? With so many choices of desserts it’s easy to see why many love these sweet apres dinner finishers. From ice cream to cake, fruit salads to pies, what’s not to like? A favourite dessert for many, and one that tends to be featured after many roast dinners is that of pies, crisps, and cobblers. But what’s the difference between each and how do you make them? You can read about cobblers and pie in this article below! A Crisp is a fruit based dessert that is typically fully covered in a mixture of flour, granola (or other cereals), nuts and sugar all mixed together and baked on top of the fruits themselves. This topping covers the fruit entirely and bakes to a golden brown and hardens up just slightly. Sometimes the fruit juices can leak on top of the crisp, but it’s nothing to be concerned about. The best part is almost any fruit makes a great crisp, but especially apples and berries, or some people even mix them to make mixed fruit crisp. Serve with ice cream. Pies differ from both crisps and cobblers in the sense that the filling is almost entirely encased in pastry shell. The dish is lined with the pastry, the filling added and then a layer of pastry is added on top of the entire thing, with small holes pierced in the top to allow steam to escape. Pies can sometimes have only strips of pastry over the filling in a crisscross pattern that showcases some of the filling beneath. Pies often are considered to be a dessert or of a sweet flavouring, usually fruit but can also include things like chocolate, banana, lemon, lime as well as different types of meats. For fish lovers, check out ‘Stargazy Pie’, although you might never look at pie the same way again! 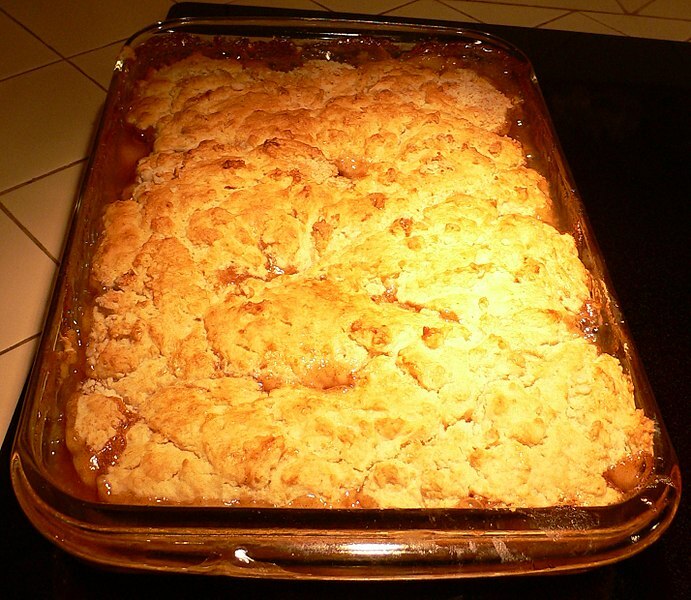 Cobbler on the other hand is somewhat similar in style to a crisp but with a batter or biscuit crust which is dropped in lumps onto the filling with spaces left between each to allow the filling to show through – much like a cobbled street, hence the name. Cobbler can come in a variety of types with mixed berries and fruits being the most popular. So which will you choose for your next dinner party? Make sure to have ice cream on hand to go with whichever you choose and serve them up slightly warm. Bon appetit!